Not to be confused with sensor, censure, or censor (disambiguation). A censer, incense burner, perfume burner or pastille burner (these may be hyphenated) is a vessel made for burning incense or perfume in some solid form. These vessels vary greatly in size, form, and material of construction, and have been in use since ancient times in many cultures, in both secular and religious contexts. They may consist of simple earthenware bowls or fire pots to intricately carved silver or gold vessels, small table top objects a few centimetres tall to as many as several metres high. Many designs use openwork to allow a flow of air. In many cultures, burning incense has spiritual and religious connotations, and this influences the design and decoration of the censer. Often, especially in Western contexts, "censer" is used for pieces made for religious use, especially those on chains that are swung through the air to spread the incense smoke widely, while "perfume burner" is used for objects made for secular use. The original meaning of pastille was a small compressed mixture of aromatic plant material and charcoal that was lit to release the odour, and pastille-burners were designed for this, for use in the home. The pastilles were made at home until their heyday in the early 19th century, and the burners are often made in pottery or porcelain. Some types could also be used as pomanders, where the perfume diffuses slowly by evaporation rather than burning. For direct-burning incense, pieces of the incense are burned by placing them directly on top of a heat source or on a hot metal plate in a censer or thurible. Indirect-burning incense, also called "non-combustible incense", is a combination of aromatic ingredients that are not prepared in any particular way or encouraged into any particular form, leaving it mostly unsuitable for direct combustion. The use of this class of incense requires a separate heat source since it does not generally kindle a fire capable of burning itself and may not ignite at all under normal conditions. This incense can vary in the duration of its burning with the texture of the material. Finer ingredients tend to burn more rapidly, while coarsely ground or whole chunks may be consumed very gradually as they have less total surface area. The heat is traditionally provided by charcoal or glowing embers. For home use of granulated incense, small, concave charcoal briquettes are sold. One lights the corner of the briquette on fire, then places it in the censer and extinguishes the flame. After the glowing sparks traverse the entire briquette, it is ready to have incense placed on it. For direct-burning incense, the tip or end of the incense is ignited with a flame or other heat source until the incense begins to turn into ash at the burning end. Flames on the incense are then fanned or blown out, with the incense continuing to burn without a flame on its own. Censers made for stick incense are also available; these are simply a long, thin plate of wood, metal, or ceramic, bent up and perforated at one end to hold the incense. They serve to catch the ash of the burning incense stick. In Taoist and Buddhist temples, the inner spaces are scented with thick coiled incense, which are either hung from the ceiling or on special stands. Worshipers at the temples light and burn sticks of incense. Individual sticks of incense are then vertically placed into individual censers. The history of censers in Chinese culture probably began in the late Eastern Zhou Dynasty (770–256 BCE). The Chinese words meaning "censer" are compounds of lu (爐 or 炉 "brazier; stove; furnace"), which originated as a type of Chinese bronze. Xianglu (香爐, with "incense") "incense burner; censer" is the most common term. Xunlu (熏爐, with "smoke; fumigate; cure (food) with smoke", or 薰爐, with "fragrance; an aromatic grass") means "small censer, esp. for fumigating or scenting clothing; censing basket", which Edward H. Schafer described. "Censing baskets" were globes of hollow metal, pierced with intricate floral or animal designs; within the globe, an iron cup, suspended on gimbals, contained the burning incense. They were used to perfume garments and bedclothes, and even to kill insects. Shoulu (手爐, with "hand") means "hand-held censer; handwarmer". I value this perfect utensil, lofty and steep as a mountain! Its top is like Hua Shan in yet its foot is a bronze plate. It contains rare perfumes, red flames and green smoke; densely ornamented are its sides, and its summit joins azure heaven. A myriad animals are depicted on it. Ah, from it sides I can see ever further than Li Lou [who had legendary eyesight]. Archeologists excavated many (c. second century BCE) boshanlu at Mawangdui, and some contained the remains of ashes. Analysis revealed aromatic plants such as maoxiang (茅香 "Imperata cylindrica, thatch grass"), gaoliangjiang (高良薑 "Galangal"), xinyi (辛夷 "Magnolia liliiflora, Mulan magnolia), and gaoben (藁本"Ligusticum sinense, Chinese lovage"). Scholars presume burning these grasses "may have facilitated communication with spirits" during funeral ceremonies. Thus all in all there is much reason for thinking that the ancient Taoists experimented systematically with hallucinogenic smokes, using techniques which arose directly out of liturgical observance. … At all events the incense-burner remained the centre of changes and transformations associated with worship, sacrifice, ascending perfume of sweet savour, fire, combustion, disintegration, transformation, vision, communication with spiritual beings, and assurances of immortality. Wai tan and nei tan met around the incense-burner. Might one not indeed think of it as their point of origin? These Waidan (外丹 "outer alchemy") and neidan (內丹 "inner alchemy") are the primary divisions of Chinese alchemy. Chinese censers were popularly shaped like a bird or animal, sometimes designed so that the incense smoke would issue from the mouth. 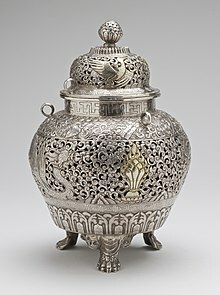 Early Islamic vessels are usually called perfume burners, and had no specific religious function, but were widely used in houses. Animal shapes, often lynx or other cats, in bronze or brass with openwork bodies are found from the 11th century until the Mongol conquests of the 13th century. A wide variety of other types were used at different times. Koro (Japanese: 香炉, kōro) is a Japanese censer often used in Japanese tea ceremonies. Examples are usually of globular form with three feet, made in pottery, Imari porcelain, Kutani ware, Kakiemon, Satsuma, enamel or bronze. In Japan a similar censer called a egōro (柄香炉) is used by several Buddhist sects. The egōro is usually made of brass with a long handle and no chain. Instead of charcoal, makkō powder is poured into a depression made in a bed of ash. The makkō is lit and the incense mixture is burned on top. This method is known as Sonae-kō (Religious Burning). Used domestically and ceremonially in Mesoamerica, particularly in the large Central-Mexican city of Teotihuacan (100–600 AD) and in the many kingdoms belonging to the Maya civilization, were ceramic incense burners. The most common materials for construction were Adobe, plumbate, and earthenware. These materials can be dried by the sun and were locally sourced, making them the perfect material for a Mayan craftsman. Censers vary in decoration. Some are painted using a fresco style technique or decorated with adornos, or small ceramic ornaments. These decorations usually depicted shells, beads, butterflies, flowers, and other symbols with religious significance that could to increase rainfall, agricultural abundance, fertility, wealth, good fortune or ease the transition of souls into the underworld. To identify precious materials such as jadeite and quetzal feathers, important visual markers of status, artists used colorful paints. Used to communicate with the Gods, these censers functioned for acts of religious purification. Made up of copal (tree resin), rubber, and chewing gum, the incense produced what was described as "the odor of the center of heaven." Mayan censers, which had a reservoir for incense on top of a vertical shaft were highly elaborate during the Classic period (600–900 AD), particularly in the kingdom of Palenque, and usually show the head of a Mayan deity. In Post-Classic Yucatán, particularly in the capital of the kingdom of Mayapan, censers were found in great numbers, often shaped as an aged priest or deity. Craftsmen produced Mayan censers in many sizes, some just a few inches in height, others, several feet tall. In the Eastern Orthodox Church, the Oriental Orthodox Church, as well as the Eastern Catholic Churches, censers (Greek: thymiateria) are similar in design to the Western thurible. This fourth chain passes through a hole the hasp and slides in order to easily raise the lid. There will often be 12 small bells attached to the chains, symbolising the preaching of the Twelve Apostles, where one of the bells has been silenced to symbolize the rebel Judas. In some traditions the censer with bells is normally used only by a bishop. Before a deacon begins a censing, he will take the censer to the priest (or the bishop, if he is present) for a blessing. The censers, charcoal and incense are kept in the diaconicon (sacristy) Entrance with the censer at Great Vespers. The censer is used much more frequently in the Eastern churches: typically at every vespers, matins, and Divine Liturgy, as well as pannikhidas (memorial services), and other occasional offices. If a deacon is present, he typically does much of the censing; otherwise, the priest will perform the censing. Unordained servers or acolytes are permitted to prepare and carry the censer, but may not swing it during prayers. Liturgical Censing is the practice of swinging a censer suspended from chains towards something or someone, typically an icon or person, so that smoke from the burning incense travels in that direction. Burning incense represents the prayers of the church rising towards Heaven. One commonly sung psalm during the censing is "Let my prayer arise in Thy sight as incense, and let the lifting up of my hands be an evening sacrifice." When a deacon or priest performs a full censing of the temple (church building), he will often say Psalm 51 quietly to himself. In addition to the chain censer described above, a "hand censer" (Greek: Κατσί katzi or katzion) is used on certain occasions. This device has no chains and consists of a bowl attached to a handle, often with bells attached. The lid is normally attached to the bowl with a hinge. In Greek practice, particularly as observed on Mount Athos, during the portion of Vespers known as "Lord, I cry unto Thee" the ecclesiarch (sacristan) and his assistant will perform a full censing of the temple and people using hand censers. Some churches have the practice of not using the chain censer during Holy Week, even by a priest or bishop, substituting for it the hand censer as a sign of humility, repentance and mourning over the Passion of Christ. They return to using the chain censer just before the Gospel reading at the Divine Liturgy on Great Saturday. Some Orthodox Christians use a standing censer on their icon corner (home altar). 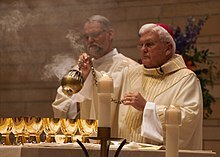 In the Latin Rite of the Catholic Church and some other groups, the censer is often called a thurible, and used during important offices (benedictions, processions, important Masses). A common design for a thurible is a metal container, about the size and shape of a coffee-pot, suspended on chains. The bowl contains hot coals, and the incense is placed on top of these. The thurible is then swung back and forth on its chains, spreading the fragrant smoke. A famous thurible is the Botafumeiro, in the cathedral of Santiago de Compostela. Suspended from the ceiling of the cathedral, the swinging of this 5-foot (1.5 m) high, 55 kilogram silver vessel is an impressive sight. One of the explanations for the great size of the Botafumeiro is that in the early days it was used to freshen the air in the cathedral after being visited by droves of travel-weary pilgrims. It was also once believed that the incense smoke guarded against contracting the many diseases that plagued the populace in past centuries. Hindus have traditionally used an earthen censer called a Dhunachi for burning incense with coal, though coconut husk is also used. The vessel has a flared shape with a curved handle and an open top. There are also brass and silver versions. Chinese porcelain stool (1575-1600) with Ottoman metallic mounting and modifications (1618) for use as an incense burner Turkish and Islamic Arts Museum. Insect-Cage Incense Burner, late 19th to early 20th century, by Tetsunao, Japan. Brass incense burner at Jaffna museum, Sri Lanka. ^ "Scents of earth". www.scents-of-earth.com. ^ Erickson, Susan N. (1992). "Boshanlu: Mountain Censers of the Western Han Period: A Typological and Iconological Analysis", Archives of Asian Art 45:6-28. ^ Needham, Joseph and Lu Gwei-Djen (1974). Science and Civilisation in China: Volume 5, Chemistry and Chemical Technology; Part 2, Spagyrical Discovery and Invention: Magisteries of Gold and Immortality. Cambridge University Press. p. 133. ^ Erickson (1992), p. 15. ^ Needham and Lu (1974), p. 150. ^ a b Needham and Lu (1974), p. 151. ^ Needham and Lu (1974), p. 154. ^ Bruhns, Karen Olsen. “Plumbate Origins Revisited.” American Antiquity, vol. 45, no. 04, 1980, pp. 845–848., doi:10.2307/280154. ^ Feinman, Gary M., and Dorie Reents-Budet. "Painting the Maya Universe: Royal Ceramics of the Classic Period." The Hispanic American Historical Review 75, no. 3 (1995): 457. doi:10.2307/2517243. ^ Morehart, Christopher T., Abigail Meza Peñaloza, Carlos Serrano Sánchez, Emily Mcclung De Tapia, and Emilio Ibarra Morales. "Human Sacrifice During the Epiclassic Period in the Northern Basin of Mexico." Latin American Antiquity 23, no. 04 (2012): 426-48. doi:10.7183/1045-6635.23.4.426. ^ Coe, Michael D. The Maya, Seventh Edition. 2005. ^ a b c d Herrera, Matthew D. Holy Smoke: The Use of Incense in the Catholic Church Archived 2012-09-12 at the Wayback Machine. San Luis Obispo: Tixlini Scriptorium, 2011.